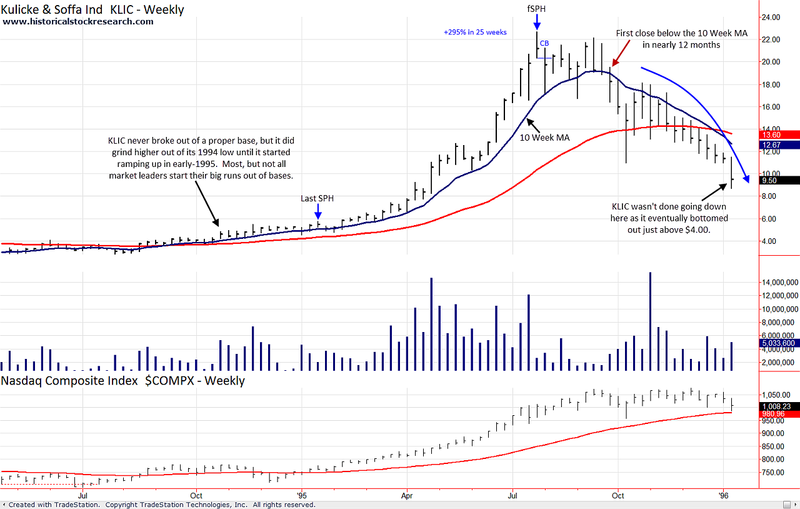 A swing point high may give you an advanced warning before a stock breaks down because many signals occur above the 10 Week Moving Average (MA). 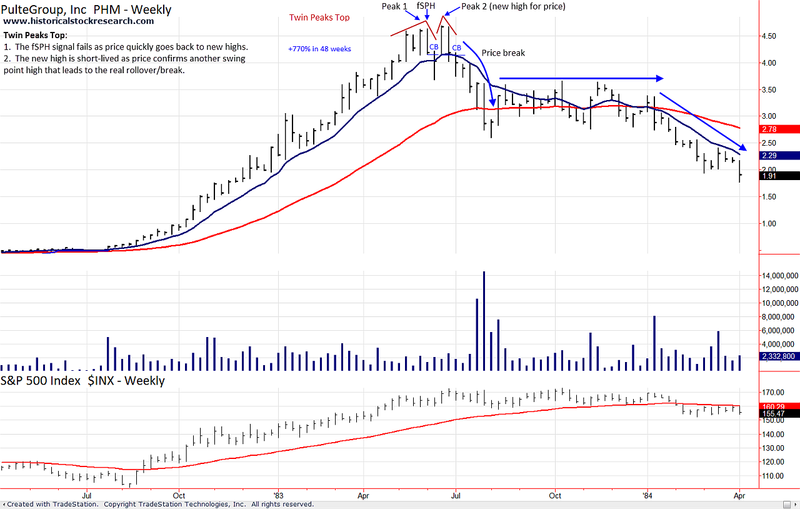 The First Swing Point High (fSPH) is important because it represents a subtle change in a stock's character for the first time since beginning its uptrend. If this change occurs after an extended run, it may signal the beginning of the end for a market leading stock. Most fSPH signals are found in higher-beta stocks that have doubled or more. However, don't discount fSPH signals in lower-beta names. Relative to a high-beta stock, a 25-50% gain in a less glamorous name may invite profit-taking at the first sign of trouble. 2. Volume during the confirmation bar (CB). Volume is not part of the fSPH signal, however, heavy volume can add conviction to the fSPH signal. 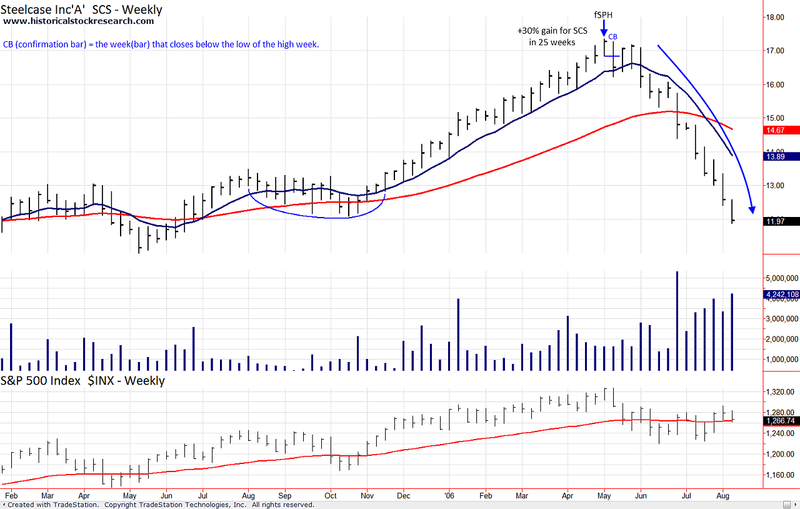 First Swing Point High (fSPH) signals may be followed by a close below the 10 Week MA. For many stocks, it'll be the first close below the 10 Week MA since breaking out of a base, which may be significant if taken into context with the fSPH signal. A Twin Peaks Top features two swing point highs next to each other after the fSPH signal fails to mark the high point for price. When this occurs, it tells you the trend is turning weaker and choppier because the time between swing point high signals is getting shorter. Please >>CLICK HERE<< to go to Bearish Butterfly Tops.